0.20ct. 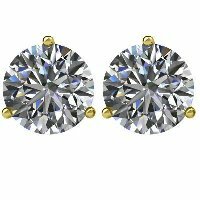 Diamond Earrings - 14K gold 3-prongs, friction back diamond earrings. Diamonds together weigh approximately 0.20ct and are graded as SI in clarity G-H in color. Diamond earrings 0.20ct. - 14K white gold, 3-prongs, friction back diamond earrings. Diamonds together weigh approximately 0.20ct and are graded as SI in clarity G-H in color. Diamond Earrings 0.25ct. 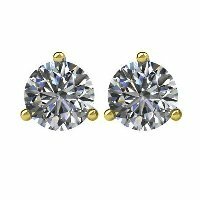 - 14K gold 3-prongs, friction back diamond earrings. Diamonds together weigh approximately 0.25ct and are graded as SI in clarity G-H in color. 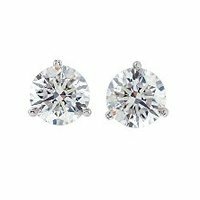 0.25 ct. Martini Diamond Earrings - 14K white gold, 3-prongs, friction back diamond earrings. Diamonds together weigh 0.25ct and are graded as SI in clarity G-H in color. 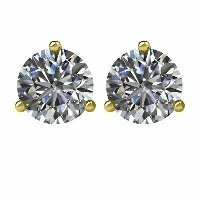 0.33ct Martini Round Diamonds Earring - 14K gold, 3-prongs, friction back diamond earrings. Diamonds together weigh approximately 0.33ct and are graded as SI in clarity G-H in color. 0.33ct White Gold Diamond Stud Earrings - 14K white gold, 3-prongs, friction back diamond earrings. Diamonds together weigh approximately 0.33ct and are graded as SI in clarity G-H in color. 0.50ct. 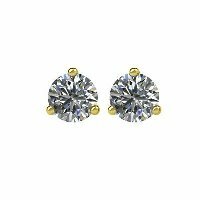 Diamond Stud Earrings - 14K gold, 3-prongs, friction back diamond earrings. Diamonds together weigh approximately 0.50ct and are graded as SI in clarity G-H in color. 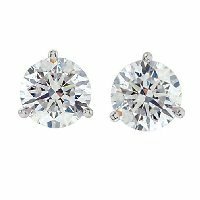 Diamond Stud Earrings 0.50ct - 14K white gold, 3-prongs, friction back diamond earrings. Diamonds together weigh approximately 0.50ct and are graded as SI in clarity G-H in color. 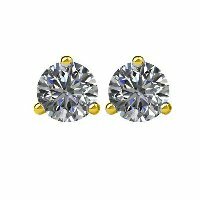 14K Diamond Stud Earrings - 14K gold, 3-prongs, friction back diamond earrings. Diamonds together weigh approximately 0.75ct and are graded as SI in clarity G-H in color. 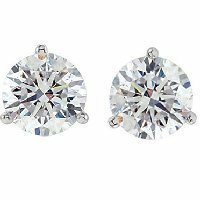 White Gold Diamond Earrings - 14K white gold, 3-prongs, friction back diamond earrings. Diamonds together weigh approximately 3.0ct and are graded as SI in clarity G-H in color. 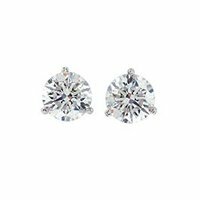 14K Diamond Stud Earrings - 14K gold, 3-prongs, friction back diamond earrings. Diamonds together weigh approximately 1.00ct and are graded as SI in clarity G-H in color. 14K Diamond Stud Earrings - 14K white gold, 3-prongs, friction back diamond earrings. Diamonds together weigh approximately 1.00ct and are graded as SI in clarity G-H in color. 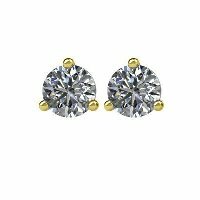 14K Diamond Stud Earrings - 14K gold, 3-prongs, friction back diamond earrings. Diamonds together weigh approximately 1.50ct and are graded as SI in clarity G-H in color. 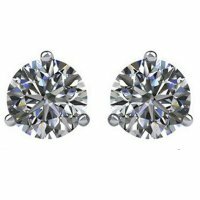 1.50ct 3-Prongs Diamond Earrings - 14K white gold, 3-prongs, friction back diamond earrings. Diamonds together weigh approximately 1.50ct and are graded as SI in clarity G-H in color. 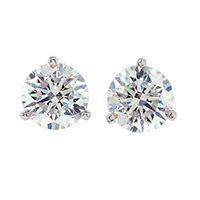 3-Prongs Round Diamond Earrings 2.0ct. 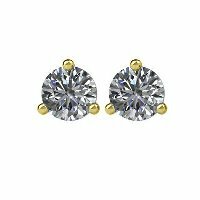 - 14K gold, 3-prongs, friction back diamond earrings. Diamonds together weigh approximately 2.00ct and are graded as SI in clarity G-H in color. 2.0ct. 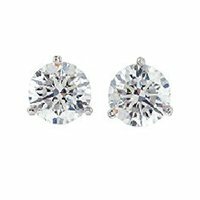 Round Diamond Stud Earrings - 14K white gold, 3-prongs, friction back diamond earrings. Diamonds together weigh approximately 2.0ct and are graded as SI in clarity G-H in color.